A core text for first year modules in Engineering Materials and Technology, offering student-centred learning based in real-life engineering practice. 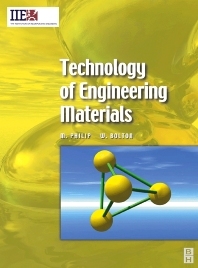 A comprehensive materials technology text for first year engineering students, Technology of Engineering Materials provides all the essential information required for application in real-life engineering practice. In line with the philosophy of the IIE Core Textbook Series, a uniquely student-centred approach to the subject is given. The principles and practical considerations that underlie the informed selection of materials in mechanical and production engineering are introduced in an easily accessible format, through case studies, assignments and knowledge-check questions, all designed to aid student learning. Practical application of the subject within an engineering context is stressed throughout. This book is tailored to be used on a wide range of introductory courses at first degree and HND level. As with all texts in the IIE Core Textbook Series, an interactive style brings the subject to life with activities and case studies rather than pages of theory alone. Key numerical and statistical techniques are introduced through Maths in Action panels located within the main text. The content has been carefully matched to a variety of first year degree modules including IEng and other BSc / BEng Engineering and Technology courses. Lecturers will find the breadth of material covered gears the book towards a flexible style of use, which can be tailored to their syllabus. This essential text is part of the IIE textbook series from Butterworth Heinemann - textbooks to form the strong practical, business and academic foundations for the professional development of tomorrow's incorporated engineers. ·Content matched to requirements of a wide range of undergraduate modules within Engineering and Technology courses ·Practical text featuring worked examples, case studies, assignments and knowledge-check questions throughout. ·Breadth of coverage to enable tutors to tailor the book's use to suit their particular syllabus. Mathew Philip is a Professor at the University of Brighton in Brighton, UK.